Aukey Wireless FM Transmitter Radio Car Kit with 3.5mm Audio Port - NEW! High visibility display with intuitive buttons to toggle FM frequency. Works with any device that has a 3.5mm audio output including Android, iOS and other popular audio devices. This is mainly an issue on the west coast or south florida. 4.5 out of 5 stars - Aukey Wireless FM Transmitter Radio Car Kit with 3.5mm Audio Port - NEW! 7 product ratings7 product ratings - Aukey Wireless FM Transmitter Radio Car Kit with 3.5mm Audio Port - NEW! Fill your space with big sound. The AUKEY SK-M17 is as tough as it is powerful. Connect your smartphone, tablet, or other Bluetooth devices wirelessly and experience the wireless audio clarity of Bluetooth A2DP. O pe n boxt o sh ow w ha t yo u get. G ot a s a gi ft a nd h at e ov er e ar h ea dp ho ne s.
Aukey - Grey Bluetooth Wireless Headphones. With Mic. In Ear Headphones. Grey Bluetooth Wireless Headphones. In Ear Headphones. Openp ac ka ge - to s ho w wh at you’re ge tt in g. Ha pp y bi dd in g.
AUKEY EP-E1 Magnetic Wireless Sports Earbuds. Micro-USB Cable. 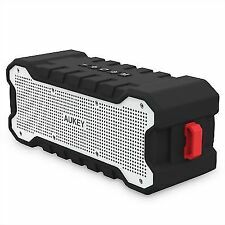 AUKEY Bluetooth Speaker with Boosted Bass, Powerful Sound and Power Bank Function for iPhone, Samsung Phones, and More. Boosted Bass: Integrated digital signal processor (DSP) utilizes MaxxBass technology for enhanced bass performance and improved power efficiency. AUKEY Portable Bluetooth Speaker with Fabric Front,Hanging Strap,and 3.5mm Audio. Condition is New. Shipped with USPS Priority Mail. 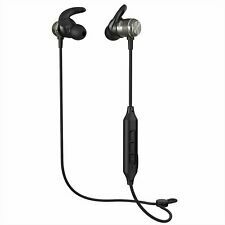 Ailey bluetooth earbuds Ep-b80. Open box but brand new never used. Shipped Free with USPS First Class Package. Easy Use: High-visibility display with intuitive buttons to change FM frequency. Integrated DSP utilizes MaxxBass technology for enhanced bass performance. Audio Output Power: 2 x 10W (main drivers) 15W (woofer). Audio Drivers: Two 52mm main drivers, one 78mm woofer, two 75mm passive radiators. Convenient magnetic system holds the earbuds together around your neck or in your bag when not in use. Technology: BT 4.1, A2DP, AVRCP, HSP, HFP, aptX. Get rich, robust sound with punchy bass and a choice of three EQ sound signatures. Wireless Earbuds, AUKEY Latitude Lite Bluetooth Headphones with HiFi Sound, Sweat-Resistant, 8-Hour Battery Life, Built-in Mic, Secure Fit Sports Earphones for Gym, Running and Workout. Trending at $29.89eBay determines this price through a machine learned model of the product's sale prices within the last 90 days. Wireless Earbuds, AUKEY Latitude Lite Bluetooth Headphones with HiFi Sound, Sweat-Resistant, 8-Hour Battery Life, Built-in Mic, Secure Fit Sports Earphones for Gym, Running and Workout. Manufacturer: AUKEY. Below is the spec Connect quickly and effortlessly manage audio playback and calls with multifunction buttons and a built-in mic. You can even connect ancient non-Bluetooth 3.5mm audio devices with the included 3.5mm audio cable. Own a car without a 3.5mm AUX audio input?. The BT-C5 is the product for you! Tune in to your very own FM radio station in any car with this FM transmitter wireless audio kit. Works with any device that has a 3.5mm audio output including Android, iOS and other popular audio devices. AUKEY SK-M39 Bass Station. Enhanced bass is added by the powerful 10W down-firing subwoofer. Low-frequency bass reproduction is further optimized by the rear bass reflex port and the wireless speaker's passive radiator. Audio sensation: Wired audio solution seamlessly combines premium sound performance, on-the-go design, and maximum versatility. Interchangeable silicone buds are included (S/M/L) and a flexible ear hook ensure a precise, secure fit. 2 of the earbuds are cut as shown in picture. These earbuds are new and still sealed in box with original shrinkwrap. Headphone color not marked on outside of box - unknown color. Pictures are of the actual earbuds and only what is pictured is included in this sale. Instantly add wireless or wired audio to your existing car stereo system. Includes a USB cable. Silicone housing provides shock and drop resistance. AUKEY Bluetooth Headphones on Ear, Wireless Headphones Deep Bass, Mic 3.5mm Audi. Condition is New. Shipped with USPS First Class Package. AUKEY Latitude Wireless Earbuds Bluetooth Headphones. Sweat-Resistance. New. AUKEY Latitude Wireless Earbuds Bluetooth Headphones. Dependable Design: Sealed casing and internal nano coating protect against sweat and rain (IPX4 certified), so you can depend on these earbuds during tough workouts at the gym or outside in all conditions. BLUETOOTH 4.1: Latest Bluetooth 4.1 Technology with CSR8635 Bluetooth Chip, more energy efficient and instant pairing to your smartphone or tablet from up to 33 feet away. Seamlessly stream and share your music, movies, podcast and phone calls anywhere. AUKEY Portable Bluetooth Speaker with Powerful Stereo Sound and Built-in Mic. Condition is New other (see details). Shipped with USPS Priority Mail. Enjoy fluid, high-quality audio; a total 16W of clear and balanced sound with robust bass. Dedicated DSP (digital signal processor) with MaxxBass technology enhances audio performance (including bass that exceeds expectations for a portable speaker) and improves power efficiency. AUKEY Bluetooth Headphones, Active Noise-Canceling Earbuds with 20-Hour Playtime and Built-in Mic for iPhones, Samsung and More ---Comfortable, active noise-canceling, wireless in-ear headphones that deliver a rich, energetic, compelling audio experience ---Stunning, spirited sound is at the heart of these headphones. Punchy bass, crystal-clear vocals, and other dynamic sound elements all blended together for a richer and more complete listening experience ---Connect quickly with Bluetooth 4.1, to two devices simultaneously, and effortlessly manage audio playback & calls with volume controls, multi-function button, and built-in 6th generation cVc noise-canceling microphone ---Comfortable ear-tips (in three sizes) provide a smooth seal for your ears, isolating you from external noise. aukey bluetooth earbuds Ep-b80. Shipped with USPS First Class Package. Bluetooth 4.1: Fast, easy, energy-efficient connection for all compatible devices, with a wireless range up to 10m (33 feet). AUKEY Bluetooth Speaker with Boosted Bass. Boosted Bass: Integrated digital signal processor (DSP) utilizes MaxxBass technology for enhanced bass performance and improved power efficiency. Integrated DSP utilizes MaxxBass technology for enhanced bass performance. Improved Sound: Dual drivers and bass-boosting passive radiator produce a clear and powerful sound. Silicone housing provides shock and drop resistance. We are always more than happy to help or correct any issue you may have. Color:Black Music with no Strings Attached Own a car without a 3.5mm audio input?. The BT-C4 is the product for you. Tune into your own personal FM radio station in any car with this FM transmitter kit. The highly flexible and padded neckband, which features a soft leather-like covering, fits almost any neck. Stunning, spirited sound is at the heart of these headphones. Item model number: EP-B39-US. AUKEY SK-M36 Radius Wireless Speaker. The power button in the center is a physical button to ensure the speaker isn’t turned on or off accidentally. The speaker also has a microphone for speakerphone functionality and an audio input port for use with non-Bluetooth-compatible computers and music players. 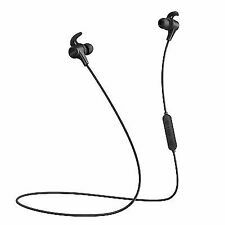 Wireless Earbuds, AUKEY Latitude Lite Bluetooth Headphones with Enhanced Bass, Sweat-Resistant, 8-Hour Battery Life, Built-in Mic, Secure Fit Sports Earphones for Gym, Running and Workout. Dependable Design: Sealed casing and internal nano coating protect against sweat and rain (IPX4 certified), so you can depend on these earbuds during tough workouts at the gym or outside in all conditions. 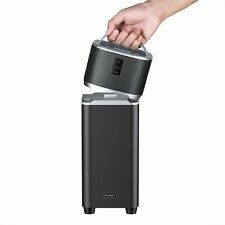 AUKEY Portable Bluetooth Speaker with Power Bank Function for iPhone, Samsung Phones and More. Manufacturer: AUKEY. Enjoy the best music inside or outside the house. MUSIC PLAYER: Fine, compact and modern design speaker with dual 7w audio drives and passive radiator to give a dynamic sound and full of energy, also an improved bass. Multiply your music by connecting up to seven more speakers. AudioLink speakers output thrilling, dynamic sound that you wouldn’t expect from a portable speaker. Link them together for high-impact sound all around. 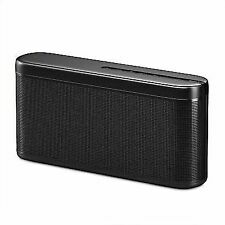 AUKEY Bluetooth Speaker with Boosted Bass, Powerful Sound and Power Bank Function for iPhone, Samsung Phones, and More. AUkey SK M33 review - YouTube. Integrated DSP utilizes MaxxBass technology for enhanced bass performance. [AUKEY product strengths] AUKEY will provide a two-year peace of mind warranty. By Bluetooth and FM transmitter, and adjust the FM frequency and the body of the FM frequency of the in-vehicle audio, you can listen to a smart phone, a favorite song from the tablet or other device in the car of the FM radio system. Trending at $36.74eBay determines this price through a machine learned model of the product's sale prices within the last 90 days. Despite being a compact and handy speaker, the SK-S2 is equipped with surprisingly large and powerful 52mm speaker driver and 50mm bass-enhancing passive radiator to give you 5W of big sound. A compact and charming curved design. Durable high-density silicone casing provides a rugged layer of protection from daily wear and tear. Choose your sound signature-enhanced bass or boosted treble-with the press of the mode button. You can even connect your old, non-Bluetooth 3.5mm audio devices via audio input with the included 3.5mm audio cable. Bluetooth 4.2. Compared to previous versions, Bluetooth 4.2 brings you faster, more secure connectivity and increased power efficiency for connected devices (like your phone) when wirelessly streaming audio at distances up to 33 feet.